I'm looking for the simplest/cheapest (but safe!) way to build a 4.5A test-load for an LMR14050-based 24Vdc to 12Vdc/5A step-down voltage regulator circuit. As it's a bit hard for me to find the suggested bulbs, I thought of hooking-up 9 of these alternative 5W bulbs from eBay in series to give me more or less the power draw I'm after - Would these bulbs work for the intended purpose? Also, what would be the recommended capacitor value for each bulb? So apparently the bulbs I found aren't suitable - does anyone know where I can order the correct bulbs (i.e. each drawing 500mA more or less at 12Vdc) online? Automotive incandescent ight bulbs are what most people use for 12V load testing. These are available in power ratings starting at about 5 Watts all the way up 55 Watts or more. The ones that I use in my shop draw about 1A each and I simply use as many as required to get the desired load current. Incandescent lamps have the advantages of being low cost and readily available. 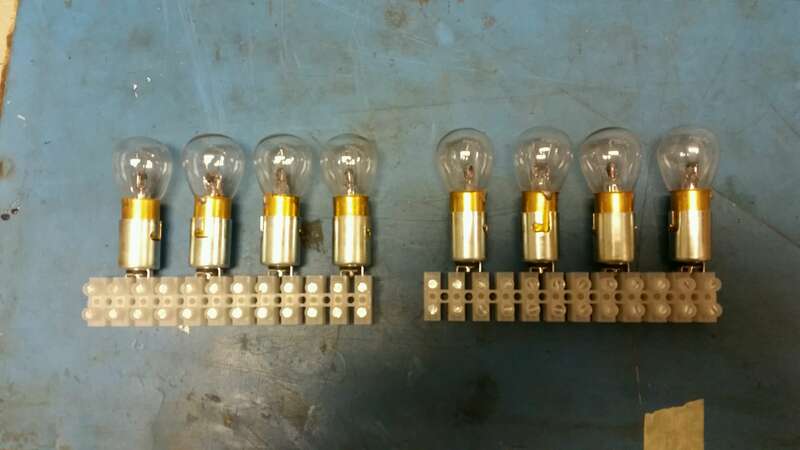 Lamps similar to these and their sockets can be had almost for free if you visit a local automobile wrecking (salvage) yard. I would just use a couple of power resistors. Just monitor the voltage under load and make sure it stays at 12V. For fun, get a single 2 ohm resistor, rated at 10 watts (yes, you are dissipating 40 watts). If possible, get a power resistor with hollow core. Place this in a beaker or flask 2/3 filled with WATER. Connect this water-cooled load to your 12 volt supply. Not the answer you're looking for? Browse other questions tagged voltage-regulator switch-mode-power-supply test step-down or ask your own question. How can you cheaply make an output pin source/sink about 5 amps of 5vDC, 12vDC, 24vDC, and 120vAC selectively? How do I calculate the transformer to use? Cheapest/quickest way to power 2 x 12v fans from 24v baseboard fan socket?